Take a break from all the heat, traffic and pollution synonymous with Delhi and abscond to the mountains. All you need is a weekend (or a few days more) and a full tank of petrol to enjoy these hill stations near Delhi. A quieter version of Mussoorie, Landour has a rustic charm about it that is ideal for when you need a break from the city’s clamour. If you’re confused about where to go, this guide will help you explore the place. Also, you can hit up La Villa Bethany to suit your accommodation needs. Shimla is a refreshing amalgam of history and breathtaking views. There’s the Viceregal Lodge, a bird park, the Ridge, Chadwick falls, Mall Road and many churches, museums, temples and theatres worth checking out. While you’re there, stay at this beautiful chalet and make a visit to this beautiful cafe, run by inmates for some fresh bakes and a chance to interact with the staff. One of the most visited hill stations in the country, Nainital is especially great in winters as the crowds generally disappear at this time. You can book this homestay that’s perfect to enjoy the scenic view in solitude. You could even drive down to Bhimtal which is less than an hour away and is great for trekking and paragliding. 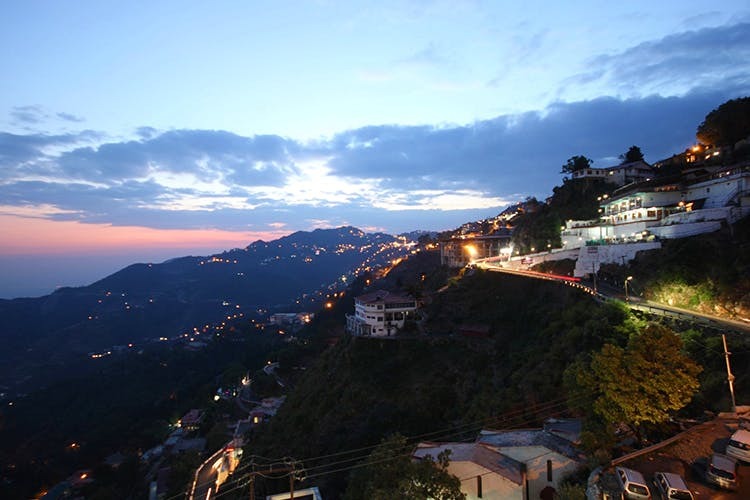 Mussoorie is home to lush green hills and ample flora and fauna, which is a sight for sore eyes. Although it has now become quite crowded, the place is perfect for those who love trekking and exploring its rumbling waterfalls. Also, check out Doma’s Inn for juicy momos or Little Llama Café [AB1] for their hibiscus tea or a warm cup of Red Velvet Hot Chocolate. A small hill station with a stunning view of the Himalayas, it is fairly untouched by heavy commercial activity, since it’s mainly an army cantonment area. Click here to know how to enjoy the place best. Don’t forget to add the the Bhulla Lake, Tip N Top and this quaint café and in your list of must-visit places here. About 35 kms from Chandigarh, this town is known for its beautiful apple and peach orchards. Stock up on delicious jams and fruit juices if you’re there. For a fun cable car ride, you can also visit the Timber Trail resort. Situated amidst the lush green forests of Himachal Pradesh, Kasauli is a beautiful, quaint town. Once a colonial possession, you can see the remnants of the British legacy in its local architecture. We say, to enjoy the view that this place has to offer to its fullest, take a stroll along the lower Mall road which leads to the Man-ki Point (it’s the highest point and has a small temple). Located in the Almora district, Ranikhet literally means ‘queens land’. It offers everything to pacify the nerves of an avid city dweller, and makes for a great family vacay. There are a lot of easy treks you can explore — the one from Chaubatia orchards to Holm Farm is quite popular. Ever wanted to try your luck at skiing? Then make Auli your next holiday destination. You can even dare a trek to Nanda Devi (it’s India second highest peak). Make sure to visit the Valley Of Flowers which some say, is the most beautiful trek in the world. About 55 kms away from Shimla, Chail overlooks the Satluj valley. Frequented by the Maharaja of Patiala, it has a beautiful palace (that’s now a hotel) which you can visit, a wildlife sanctuary and many small hilltop temples. Want to be near water whilst surrounded by hills? It’s possible at Sattal, a heavenly place which boasts of seven mysteriously interconnected freshwater lakes surrounded by a dense forest. The lakes are home to many migratory birds. Wildlife photographers, this is one place you cannot miss.